Automotive repair news for Do It Your selfers. New automotive repair products end your oil burning, valve tap, power loss, rough shift, other problems. Contact info: On a smartphone, to ask a question, order this product, call me at 512 665 3388... george New products for Do It Your Selfers wanting new products to end oil burning, valve tap, power loss, rough shift problems. Mega Power's Worn Motor Treatment is a good Do It Yourself product to help end your motors oil consumption problem. The Worn Motor Treatment makes automotive repair news because it is the only way known to end oil burning at the root of its problem. I have installed this product in dozens of oil burners and enjoyed the end of the problem - often for years. I honestly can tell you this product has help me avoid thousands in overhaul expense. Its an amazing invention. Nothing else like it! oil burning. Get on with life. Add - drive, works to end the problem as you drive in a few miles. This annoying problem can beat your engine to death. Sometimes it happens when you first start up the motor in the morning. Other times it comes and goes. And a lot of times it hammers a way knocking all the time. The tapping can be caused by 3 different negative conditions, and requires well over $1500 to $3500 tocorrect - at the lease. For car owners, there is a chemical invention that does the job, package to easily install by anyone, for under $100. Its a "dirt" residue problem, and this Mega Power Valve Treatment is 100% successful in ending the tap - permanently, whatever the cause. This fast-acting, complex product makes automotive repair news because it is made easy to install by anyone. Customers say it ends the tap, "Often in minutes." Wouldn't that make you happy? This Valve Tap Treatment may be just what you need to get your motor quiet again - keep it from beating itself to death. Add - drive, works to end the problem as you drive in a few miles. In any case, the automotive repair news is that the Mega Power Tune Up Treatment addresses and ends all those problems. So, if you think the problem happens to be inside, you will be amazed that 5 minutes after you install the Mega Power Tune Up Treatment most people say their motor runs as if brand new. I say the same thing. It is the best medicine I ever found to make sick motors run great. Along with a good tuneup out-side -like new spark plugs, and this treatment working inside, cleaning, smoothing, friction modifying, and opening of your clogged catalytic converter, you're bound to gain many more years of dependable service out your car. Add - drive, works to end the problem as you drive in a few miles. 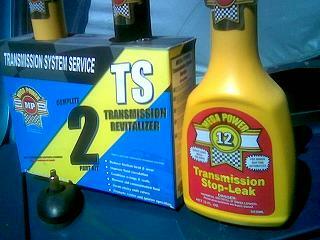 Mega Power Transmission Treatment is the perfect product to get your transmission back shifting smoothly again. This Do It yourself car and commercial equipment repair news maker does what it claims to - or its free to you, if not satisfied. Please note: 2 refunds last 267 days. Like all Mega Power Products, the Mega Power Transmission Treatment frictions modifies your transmission for unbelievably smooth shifting performance again. Order this product. Get the joy of smooth shifting back in just a few miles - guaranteed. Add - drive, works to end the problem as you drive in a few miles. The repair avoiding news for car, truck, and equipment owners is good news. These products are what your car needs. Order the products on the page you go too.